Irlam Wharf is a place on the waterways minor waterways place place on the waterways major waterways place village town city on the Manchester Ship Canal (Main Line) between Walton Junction (Junction of Manchester Ship Canal Main Line and Walton Lock Branch) (8 miles and 5¾ furlongs and 1 lock to the west) and Pomona Dock No 4 (Junction with Branch to Bridgewater Canal) (7 miles and 5½ furlongs and 3 locks to the east). The nearest place in the direction of Walton Junction is Partingham Coaling Basin; 4¼ furlongs away. 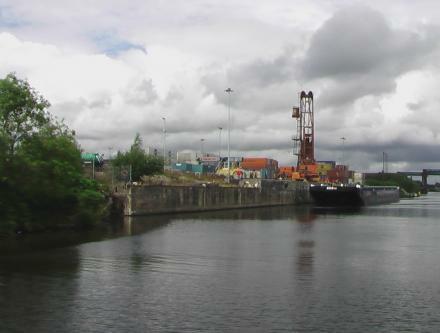 The nearest place in the direction of Pomona Dock No 4 is Mersey Weir; 2½ furlongs away. Ferry Rd, Irlam, M44 6DN — 1587 yards to the north. Manchester, M44 5 — 1264 yards to the west. 15 Hamilton Davies House, 117c Liverpool Rd, Cadishead, Manchester, M44 5BG — 1568 yards to the southwest. Wellness Within Therapy Centre, Hamilton Davies House, 117c Liverpool Rd, Cadishead, Manchester, M445BG — 1568 yards to the southwest. 557 Liverpool Road Irlam, Manchester, M44 6ZT — 1041 yards to the northwest. 524-526 Liverpool Rd, Irlam, M44 6AJ — 1190 yards to the northwest. Preston Hall Preston Avenue Irlam Manchester M445XB, Manchester — 1352 yards to the west. 621-623 Liverpool Road, Irlam, Manchester, M44 5BE — 1038 yards to the northwest. 91 liverpool road, Manchester, M44 5BG — 1492 yards to the west. Manchester — 1281 yards to the north. Manchester — 1309 yards to the north. Liverpool Road, Manchester, M4 4 6 — 1332 yards to the north. Irlam, Manchester — 1073 yards to the northwest. Unit 4 weir mill, stockport United Kingdom, SK3 0AG — 1297 yards to the west. 35 Chancery Gate Business Centre, Manchester, M44 6RA — 728 yards to the northwest. Manchester — 43 yards to the west. Liverpool Road, Irlam, M44 6BR — 1250 yards to the north. Unit 1 Siemens Road, Manchester, M44 5AH — 1397 yards to the southwest. Liverpool Road, Manchester, M44 — 1523 yards to the north. 559a Liverpool road, Irlam, M44 5BE — 1055 yards to the northwest. Manchester, M31 — 1271 yards to the east. Allotment Rd, Manchester, M44 5 — 1610 yards to the west. Based in Irlam, Manchester — 1066 yards to the northwest. Irlam — 43 yards to the west. 111 Liverpool Rd, Manchester, M445 — 1545 yards to the southwest. 677 Liverpool Road, Manchester, M44 5GQ — 1038 yards to the west. Irlam Wharf Road, Manchester, M44 5PN — 142 yards to the northwest. Unit 1 Siemens Road, Manchester, M44 5AH — 1401 yards to the southwest. Carrington Business Park, Manchester — 1155 yards to the east. 312 Liverpool Road, Manchester, M44 5UG — 1403 yards to the north. Caroline Street, Irlam, Manchester, United Kingdom, M44 6AE — 1208 yards to the northwest. Manchester — 1088 yards to the northwest. 23 Carr Road, Irlam, M44 6GA — 43 yards to the west. Prince's Park, Irlam, M44 6BR — 1143 yards to the north. 211 roseway avenue, Manchester, M44 5GH — 1594 yards to the southwest. 544 Liverpool Rd, Irlam, Manchester, M44 6AJ — 1078 yards to the northwest. Manchester, M44 — 1499 yards to the southwest. Liverpool Rd., Manchester — 1219 yards to the west. 658 Liverpool Road, Irlam, Manchester, M44 5AD — 1262 yards to the west. Unit 18 Thames Trading Estate, Irlam, M44 6BP — 887 yards to the northwest.